Fiction – paperback; Thomas Allen & Son; 224 pages; 2012. At the risk of sounding like a stuck record, I always find it difficult to review a short story collection. Should I tackle each story in turn, or give my overall impression of the entire book? 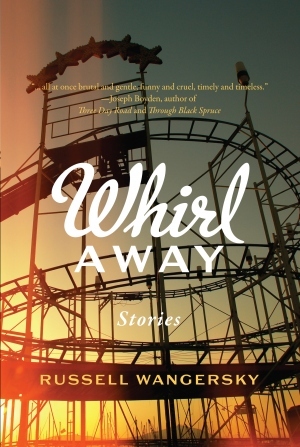 In the case of Russell Wangersky’s Giller shortlisted Whirl Away, I’m going to go for the latter option, but will single out the stories that I particularly enjoyed and that have stayed with me since finishing the collection more than a week ago. There are 12 stories here, each of which is around 20 pages in length. While I enjoyed each one, there were a handful in particular that stood out, including: Family Law, about a down-to-earth divorce lawyer, who is having marriage problems of his own; and Look Away, about a lighthouse keeper who loathes his wife’s sloppy habits and one day cracks under the pressure. In Echo, a perfect jewel of a story, Kevin Rowe is a five-year-old boy playing on the front deck of the white single-storey, vinyl-clad house he shares with his parents. As he plays in the sun, he talks to himself, making odd statements, such as, “There you go again. How many times do I have to listen to this stuff?” And: “Save it for someone who cares. Save it for someone who cares.” He is clearly imitating his father, a truck driver, who works long shifts. Then there was the sharp sound of glass breaking inside the house, and from the front windows, loud voices that got louder every time the wind from the back of the house puffed the curtains out against the window screens. Now and then, Kevin could hear snatches of words, sometimes his mother, her voice low and hard and biting off every word, his father’s a steady grumble that sometimes erupted into single words like “job” and “paid”. Once, a sound like someone smacking their hand flat down on the smooth surface of the countertop. Then, crying that sounded far away to Kevin, like he was hearing it through a cardboard tube from a roll of paper towels. The sounds kept rolling from the house, like waves slapping in on the shore. Kevin ends up falling asleep in the sun, and when he wakes up he is greeted by the sight of a police car parked on the road, “the lights on its roof flashing and throwing the shadows of the fence palings across him and all around the front of the house”. He sees a policeman, hand on top of the gun in his holster, enter the house. A little later an ambulance arrives and Kevin is taken away. The magic of the story is that you don’t know the specifics of what happened — although you can guess it was a domestic and someone, most likely Kevin’s mum (rather than his father), has been seriously hurt. You wonder what will happen to Kevin? But then there’s another part of you that wonders whether the whole encounter might have been just a dream in Kevin’s head? In Sharp Corner, we meet John and Mary Eckers, whose house is on a tight bend that fast-travelling vehicles often fail to take. The result? Fatal car accidents in their front garden. Instead of trying to solve the problem, John gets more and more obsessed, in a ghoulish kind of way, and finds the whole experience exhilarating to the point that it makes him feel truly alive. He maintains his excitement about “people regularly dying at the end of your driveway” by turning these terrible accidents into intriguing dinner party conversation. He was always amazed by the way strangers would circle around him as the stories got more detailed. It brought a sudden importance to the room, an obvious and almost respectful hush. John learned as he went along that it was better if he didn’t tell the whole story in one go, but instead kept things back, parcelling details out piece by piece, always making the careful effort to keep his face earnest, sincere, almost shaken. What John fails to recognise is that his obsessional behaviour repels and disgusts Mary. And that’s what makes this story an exceptional one: on the surface Sharp Corner is about a man seeking attention in a cruel and unusual way, but underneath it’s a portrait of a marriage and the ways in which couples constantly misinterpret one another. Each story in Whirl Away is an ideal bite-sized read, perfect if you want something to devour in your lunch hour or during a short journey by public transport. But because I was reading this to a deadline, I read it cover to cover in three different sittings. That meant I often didn’t have time to mull over each separate story, and in the end, things began to blur into one another. It doesn’t help that Wangersky adopts a similar tone and prose style in each story, so there’s only the subject matter to differentiate them. When he writes in the first person, all the characters sound the same. I also never know how to set about reviewing short story collections. I usually home in on three, or perhaps the title story, or perhaps the longest one . . . well, whatever. You’ve given a good flavour of the book here. The difficulty with SS collections is that the book needs to hang together as a whole I think. The last one I reviewed was stories all set on the Polish Baltic and together they gave a good impression of a time and location. This one, Whirl Away sounds more like Coln Toibin’s stories where the subject varies but the tone and voice is the same in them all. Hmm, hard to know what to say about it when all the characters sound the same . . .
Oh me too. I am just so lucky that Karenlee Thompson (author of 8 States of Catastrophe) guest reviews short stories for me on my blog. I don’t know what I would do without her. I largely agree with your review of this one, Kim. ‘Sharp Corner’ and ‘Echo’ (along with ‘Little World’) were stand-outs for me too, though I really didn’t rate the trio about the lawyer, and all those ambulances and car crashes got a bit much. I agree with you about his ‘curve balls’ or twists, though – he does them very well. I thought the collection was pretty mixed with only the three I mentioned lingering in my mind (I read this back in early May) and several being quite forgettable. I’m actually a bit disappointed by its presence on the Giller longlist and now shortlist – in a year where there were so many excellent Canadian short story collections for the judges to draw attention to (from my reading I’d say it’s perhaps been a better year for short fiction than novels), that the judges chose to list ‘Whirl Away’ baffles me. To be honest, I don’t read that many short story collections — maybe one a year — so it’s not really a problem. But every time it happens I get stuck with the same dilemma. You’re lucky to have Karenlee on board. I don’t read a lot of short fiction because I prefer to get lost in a novel, so I didn’t mind this one’s inclusion on the list — if nothing else, it makes me reassess my prejudices against short story collections. I did enjoy reading this; I just didn’t think it was anything particularly special. I wasn’t a big reader of short fiction prior to this year either, Kim (2007 was the last time I read a collection!) and like you have always preferred the depth and space you get in novels. But all this year I’ve been reading one or two short stories every morning before I start work. I’ve got through 35 collections so far and have come to really enjoy the form and have discovered some wonderful writers along the way. So whilst I’m far from being well-read in terms of short stories, even amongst those 35 books (10 of which would have been eligible for the Giller) ‘Whirl Away’ seemed distinctly average. Yes, I do think this is a collection which would be best appreciated with some time between each story; I sympathize with your having read it to a deadline…ouch. But I do think the collection hangs together rather well nonetheless; I particularly appreciate that it is named for tone of it all — the sense of the everyday whirling away from its characters — rather than for a specific tale within. Which isn’t to say that that’s a comfortable reading experience, to whirl through it! It’s one that I quite enjoyed, though I was surprised to see it on the shortlist, and agree with David that there are some outstanding collections that have been overlooked on the Canlit prizelists this year (though Carrie Snyder’s excellent novel-in-stories did make it to the Governor General’s list!). I find short story collections, as you do, are best read over a few weeks or so. There is the odd collection that blows you away and you find very hard to put down (Lucy Wood’s ‘Diving Belles’ was one such colelction for me) but I try and read them sparingly even so just incase they start to merge and some of the magic is lost. That said this sounds like a really interesting collection, especially Echo, though I also liked the brief synposis of Look Away too.